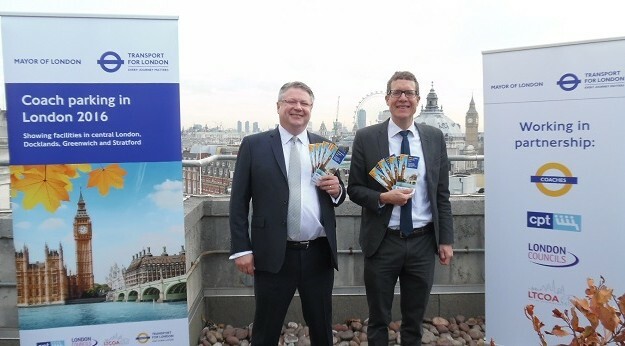 Senior officials from Transport for London (TfL) and the Confederation of Passenger Transport UK (CPT) have recently launched the new London Coach Parking Map. Available online from www.tfl.gov.uk/coachdrivers and in hard copy format, the 2016 edition provides coach drivers and tour guides with detailed information on coach parking, set-down and pick-up points, special arrangements for popular tourist attractions and also general advice and guidance for driving coaches in the Capital. “This map really is the ‘Parking Bible’ for all coach drivers in London and I would like to thank and congratulate all those involved in its production. There is no doubt that London needs coaches so we have to remember that coaches need somewhere to park. “This new map is being delivered in time to help during the busiest time of the year for the coach and tourism industry. We want to make it easier to drive and park a coach in central London because we recognise that tourism makes a major contribution to our economy and we will support that as much as possible.